The George J. Mitchell Peace Scholarship honors the Northern Ireland peace accord brokered by Senator Mitchell between the governments and peoples of Ireland and the United Kingdom. The accord was reached on Good Friday, April 10, 1998, and accepted by vote of the citizens of Ireland and Northern Ireland on May 22, 1998. The Peace Scholarship is an agreement between Maine and Ireland for a student exchange at the University level. During the academic year, students from Maine will be in residence in the city of Cork on the south coast of Ireland, at the University College Cork of the National University of Ireland. The first Peace Scholarship exchanges took place during the 1999-2000 academic year. The University of Maine System may award two one-semester or one full-year scholarships per year. Each student selected for this exchange will be named a George J. Mitchell Exchange Scholar. Be age 18 or older and be eligible for international travel at the time of the exchange. Be a Maine resident for at least one year by the application deadline (paying in-state tuition). Have demonstrated leadership skills and a commitment to community service. Be a full-time, matriculated, undergraduate student in the University of Maine System (UMS) and enrolled in a degree program. Have successfully completed two semesters of University study at a University of Maine System institution; i.e. 24 credits by the application deadline. AP and transfer credits are not considered. The George J. Mitchell Peace Scholarship was created in tribute to The Honorable George J. Mitchell in recognition of his efforts to facilitate a peace accord in Ireland and Northern Ireland. At the request of the British and Irish governments, Maine native and former U.S. Senator George J. Mitchell served as Chairman of the International Commission on Disarmament in Northern Ireland. He later served as Chairman of the Peace Talks in Northern Ireland, which led to the adoption of the peace accord in May 1998. 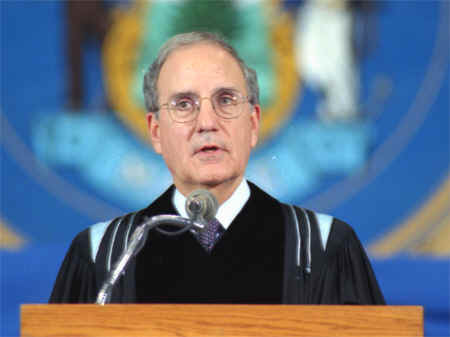 George J. Mitchell was born in Waterville, Maine, and earned his bachelor's degree from Bowdoin College. He later served as an officer in the U.S. Army Counter Intelligence Corps and earned a law degree from Georgetown University. He worked as a lawyer, served as U.S. Attorney for Maine in 1977, became a U.S. district court judge and was appointed to the U.S. Senate in 1980, eventually becoming Senate Majority Leader. He retired from the Senate in 1995. During his 14-year career in the Senate, he championed major legislation, including the first significant acid rain bill, reauthorization of the Clean Air Act, the Americans with Disabilities Act, Superfund toxic cleanup legislation, campaign finance reform and universal health care. He also served on the Joint Congressional Committee to Investigate the Iran-Contra Affair in 1987. Scholarship recipients will participate in the exchange at the University College Cork (UCC) in Cork, on the south coast of Ireland, within one year after receiving the award. For example, if you are announced as a Peace Scholarship awardee in spring semester for a one-semester period, your exchange period would begin either in the following fall or spring for one academic semester only. If you are awarded a full-year scholarship, your exchange period would begin in fall and last through spring semester. The deadline to apply for the 2019-2020 Academic Year is February 1, 2019. Applications are available on-line here. Selection date: The scholarship recipients are typically selected by April 10th---the anniversary of the signing of the Peace Accord on Good Friday 1998. Announcement date: Scholarship recipients will be notified by the University of Maine System in May--- the anniversary of the vote for the Peace Accord. UMF students work with the Office of Global Education and their Academic Advisor to complete a Credit Approval Form the semester before they go to UCC. UCC was founded in 1845 by an Act of the British Parliament and in 1908 became one of the three constituent colleges of the National University of Ireland. Over the last 30 years, UCC enrollment has dramatically increased from 1,500 to approximately 12,000. Courses are offered in eight disciplines: Arts, Celtic Studies, Commerce, Law, Science, Food Science & Technology, Engineering, and Medicine. UCC has a reputation as a top institution in Ireland for innovative research in the humanities, sciences, engineering, medicine, and business. Students come to UCC from over 60 countries. If you are interested in this exchange program, you should learn about the participating Irish institution, its course offerings (see website link above), and which of those courses might align with your home university program and future plans. Prior to submitting this application to the selection committee chair, you must seek study abroad approval on your home campus. You are required to identify the courses you want to take in Ireland, and your planned coursework must be approved by your university academic advisor, who must also sign the application. Even though your advisor will have approved the courses you intend to take in Ireland, you should bring syllabi and coursework home with you, in case there are questions concerning transfer credit. For more information regarding credit and registration, contact the Office of International Programs. Apartment-style complexes within a 20 minute walk to campus: furnished, mostly single rooms (some double or twin) with shared bathroom and kitchen facilities (may have laundry facilities). Bring bed linen & duvet/quilt. Also note that electrical outlets are 220 volts so leave appliances behind or bring adapter(s). Dormitories are open during holidays. Housing arranged upon acceptance; for details contact the Accommodation Office. There are no direct flights from the US to Cork. Connecting flights are available from London, Shannon, or Dublin. There is also bus service from Shannon Airport to Limerick, then bus or train to Cork (total under 2hrs). Air, train, or bus Dublin-Cork. Students thinking of driving must have an international driving license and adequate car insurance, but a car is not necessary, because Cork is pedestrian friendly and public transportation is available in Cork and throughout Ireland. Health and counseling service for students provided during UCC office hours. Service does not cover hospitalization or prescription charges. Students should register with a General Practitioner for doctor availability after hours. Payment is fee-for-service. Students must have their own private health and travel insurance before arrival.